Experimentation with the goal of benefiting humans is not the only type of testing done on animals. 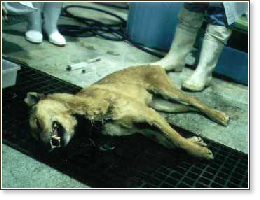 Many animals of various species are used in harmful experiments allegedly designed for the animals themselves. For example, veterinary drug companies conduct both toxicity and effectiveness studies on dogs, cats, and farm animals during the process of developing new drugs for common animal diseases. In typical experiments "for" animals, the species differences problem does not exist, since the animals used in the experiments belong to the species that the drug or therapy being tested is intended to help. While such studies are still undermined by laboratory artifacts (distortions, data errors, resulting from unnatural conditions) and stress, their results are scientifically much more valid than other types of animal experimentation. To study a dog disease, from a scientific point of view, no better model than actual dogs exists.